Like almost everybody, this time of year evokes so many great memories from our past. Living in rural Wisconsin I am guessing our Thanksgiving traditions were much different than most. The schools closed for the week, they were closed by necessity as the attendance dropped in ½ during this holiday week. It wasn’t because everyone was going out of town for the holiday, it was because everyone is out of school for deer hunting. So many of our Thanksgiving memories are around deer hunting. I remember Barb’s first deer, Forrest’s first deer and even Barb delivering us coco and pizza to one of our deer stands. But the real memories for us this time of year are around family and friends. All of whom we dearly miss this time of year. Hosting and attending family Thanksgivings, visiting friends in the Spring Valley, Somerset, Milltown and Gordon areas. We are thankful for these friends and family, our health, our happiness and our ability to live out our dreams. Here’s to hoping everyone out there had a happy thanksgiving. Our memories for this year will include a flock of turkeys running to our rig to wish us a Happy Thanksgiving. I guess they knew we already had a bird and didn’t need another one. We spent the day with Jim and Brenda at the Rubeck’s house in Custer. Rudee and Phil were nice enough to invite us over for the day. We watched football, talked smart and ate a great meal! Last week we posted our first ever reader poll asking the level of our craziness for staying here. As I write this we are experiencing sustained winds of between 30 and 40 mph, making me question our own craziness. But the results don't lie with 57% of the respondents saying we are not crazy at all. This was of course followed 20% saying we were "Bat Sh#t Crazy" I guess there is not much middle ground on peoples opinion on this. Two weeks ago we posted Jim and Barb's Favorite Things. (Contains Affiliate Links) This was by far our most popular post in the past few months with over 2,000 views in a little over a week. Do doubt it was more curiosity than people really wondering what our favorite things are! With the prairie dogs under control, it was time to get back to fencing and putting up the bird houses my brother Bob and I built this past spring. Barb put the final touches on the steel wheels she installed at the end of the driveway and another set at the gate near the rig. The deer continue to be active with this guy showing up at the rig the other day to wish us a good morning. The weather has continued to cooperate this past week with temps in the 40’s, 50’s and even 2 days in the 60’s! The next 10 days look good so it appears as though we will be here at least until December 3rd....... Stay tuned! To this in just a few days….. Welcome to what is the roller coaster weather pattern of SW South Dakota. Which is exactly why we love this area. One of the things we have been missing the past few Christmas seasons is a white Christmas and with luck we will have one this year. For that to happen we need two things to align perfectly; snow (but not too much) and temps that keep the snow but not too cold (sustained low teens) to push us south. We have been closely watching the 10 day forecast to see if there is trouble on the horizon. So far we look good through Thanksgiving. It has been suggested that we are crazy for staying up here this late in the season, and maybe we are so I thought I let you decide by posting our first ever (and maybe our last) poll question. It can be found on the top of our right sidebar. Cast your vote and let us know what you think! 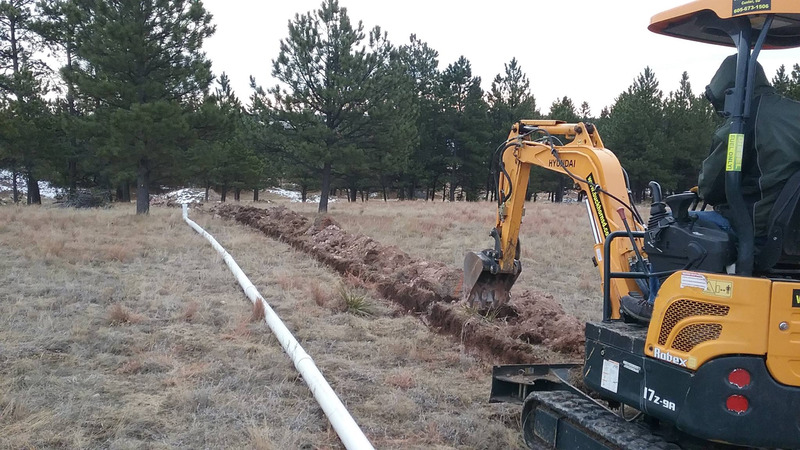 Crazy or not, we are taking advantage of the warmer weather and getting projects done that would have waited until the spring. The main thing we wanted to get done was prepping the foundation for our building site in case we are able to lay concrete next spring. It took over 300 tons of gravel but getting this done now and letting it settle through the winter will allow the gravel to compact and be ready in the spring. Had we not done this now we would have had to rent a compactor and compact the entire site next spring. (to the right of rig) are all prepped for the next phase! 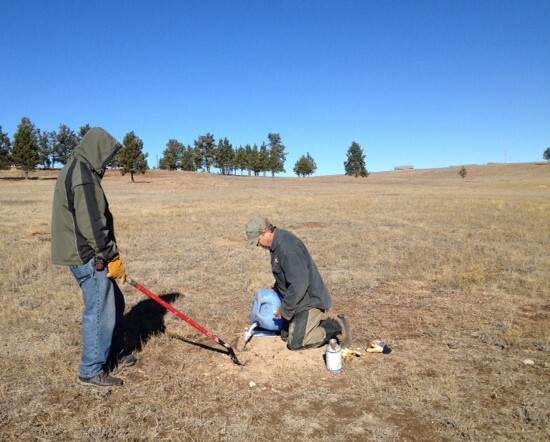 An unexpected project but one we had to take advantage of due to the warm weather was taking care of the prairie dog situation. Some might ask “Why take care of them at all?” Well there are a couple of answers. 1) It is the landowners responsibility to manage the population on their property and make sure it is not out of control. 2) Prairie dogs eat the roots of the grasses and vegetation around their dens leaving only dirt and noxious weeds. 3) The holes are a hazard to us and any livestock. 4) The neighbors are not happy when the colony spreads onto their property. This particular colony covers a substantial part of our 45 acres and parts of 160 acres when you include ours and the neighbors on both sides of us. So as a group we set out to getting the population under control. In order to purchase the products required to do this I had to become a Restricted Use Applicator meaning I had to take a an online course and test to receive an Applicators License. When it is all said and done we will have spent the better part of 7 days, applicating over 2500 holes on our property alone! If I were to guess I would say we reduced them by 90%. Now we just need to keep up on it and let nature take its course repairing the soil. This will probably take several years. This is the box the product came in! The Jordan's stopped by to help. One down, 2,499 to go! But all work and no play makes for grumpy couple so we make sure to get out for a little fun a couple times a week. Barb has been out bow hunting several times. Each time she returns home reporting that she saw several deer including a couple of nice bucks. We know there are a couple of monsters out there and she is holding out for one of those. She passed on both of these deer, maybe she is crazy! One day when it was particularly cold out she opted to stay in so I went out with just the camera. And who should come by? One of the monsters of course! He hung around the area for about 30 minutes and let me get some awesome shots of him! 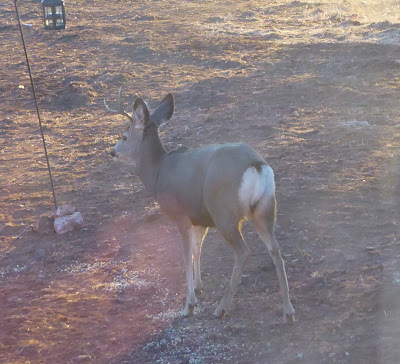 I took this one out the window of the rig when a group of mule deer stopped by to check out the excavating work. Thursday night the Jordan’s took us out to at the Buglin' Bull in Custer for dinner and a little football. Saturday we went to breakfast at the Crazy Horse Memorial followed by a trip to Custer State Park to watch the annual Buffalo and Burro Auction! You can view the buffalo and burro prior to the auction then you go to the auditorium at the visitors center for the actual auction. There's Brenda at the bottom getting ready to bid! We did not bid on anything but once we get our fence done, who knows! Because we are famous like Oprah, we thought the world is waiting with bated breath for our list of Jim and Barb’s Favorite Things! (Contains Affiliate Links) Having been on the road almost 4 years we have bought a lot of things for both everyday living or entertainment. Some of them are okay, some have been flops and some we absolutely love! So with Christmas approaching, we thought it timely to create a list of our 10 favorite things along with a few items that we are sorely disappointing with that we will never buy again. I may have mentioned a couple of these items in previous posts, that just goes to show you how happy we are with them. And bonus, if you buy off the accompanying link you not only get the great product, you also support us and our blog! By far Barb’s favorite purchase this year was her InstaPot. Over the past year almost all of our RV friends and several of our non-RV friends have become members of the InstaPot community. I describe it as a combination crock pot/pressure cooker that reduces cooking time without comprising flavor. As a frequent boondocker cooking time and how much power we are using is always top of mind and this item seems to be the ticket. Her second favorite item is her Dyson Animal Stick. This is actually her third vacuum in as many years. Our rig came with a built in system which just did not cut it. Her next vacuum was a bigger bulkier unit that did okay but just took up too much room. The Dyson Animal Stick has great suction power, is cordless and takes up very little room in the rig. Barb said she would not go back to a traditional vacuum again. Her third favorite item takes us back into the kitchen. When I asked her to list her favorite items I really did not see this one coming. She absolutely loves her magnetic measuring spoons. When asked why this made the list, she said she just loves the way that these nest together and take up very little room in the drawer. Her next item may appear to be Christmas related but she actually uses them throughout the year anywhere we are set up for a week or two. Solar String Lights are a great way to light up your perimeter any time of the year. Barb puts ours around our sunscreen when we are in Quartzsite and on a tree/bush during the holidays. She just ordered more of these as Dakota took out our most recent set by running through them and dragging them behind her. Daisy said I just HAD to include the next item. Daisy is really rough on her toys. We have bought numerous stuffed toys for both her and Dakota and they usually have them torn apart in a day, two tops. That is until we discovered goDog toys. These things are virtually indestructible and is now the only toy we buy for the dogs. Our favorite thing for Dakota is not her favorite thing but we really like it. She sheds like crazy and because her hair is so light it shows up everywhere. So one of my daily….. weekly…… once in a while duties is to brush her with the FURminator. It works great and really helps keep the shedding down to a minimum. The first is my camera. Fellow fulltimer Ingrid takes incredible pictures with this camera so I bought one so I could take some too. Although not up to her standards I am very happy with my Lumix FZ200. Not the newest model in this line but affordable and easy to use. But what to do with all those pictures after you take them? This leads to my last two favorite things. The first is an external hard drive. We actually have a couple as we don't feel comfortable saving all these memories and other important files on just one storage unit and we try not to save too many pictures on our computer itself. The last thing is pretty simple actually. It is a 5x7 picture frame where we can display some of our favorite pictures. Ours is a clip on style where we can just clip the picture on the frame so it is easy to switch it up when a viable replacement is taken. But wait, those of you who are paying attention know that was only 9 items. Well my last favorite item is something I have not found yet and leads me to our first least favorite thing. We hate, absolutely hate our water hoses. They are the same ones offered at every RV store, Walmart or anywhere else you buy RV related equipment. They are stiff, they are impossible to roll up when cold and heaven forbid you ever kink them. They are totally worthless. So my last favorite thing is a kink free/tangle free drinking water safe hose. If anyone knows of one, please let me know. Our other least favorite thing is Barb's camera. We have bought two of these, the same model in the past couple years. It is the Lumix DMCZ550. I know others have had great luck with them but in both cases dust has gotten behind the lens creating spots on the photos and grit in the zoom mechanism preventing it from operating properly. We have taken them into and called repair shops trying to get them cleaned and were told the labor cost would not be worth it. Barb attempted to take apart her first one to clean it (It is now in multiple pieces in a plastic bag and is why we bought another one). So we are once again in the market for a small pocket camera for Barb. Recommendations are welcome. Well there you have it, that's our list. We would love to hear what some of your favorite things are as we don't know what we may be missing. If these items are not up your alley and you shop Amazon, we would appreciate it if you would use the link on our sidebar when you do your shopping. It does not cost you anything additional and helps support our blog! We actually left North Dakota a day earlier than we had anticipated as we wanted to miss a forecasted snow storm on that Friday. So what did we run into on our way south? A snow storm of course. Actually there were only two stretches that were sketchy. We had the back end of the truck do a little fishtail on a slippery bridge just before the South Dakota border but that was nothing compared to what we ran into when we hit the Black Hills. We arrived in Rapid City about 5:00pm, there was a light snow but it was melting when it hit the surface. Barb was driving and although we were going to arrive at our property after dark (something we try not to do) life was good. Until……we hit the hills and the temperature plummeted and the roads became slick. Normally I am a pretty good passenger but with all the up hills, down hills and curves combined with the slippery roads I was like a cat on a hot tin roof. Finally Barb had had enough (of me) and pulled over and said she could not take me being a passenger-seat driver and told me to drive. The 30 minute drive between Rockerville and Hill City was the worse with multiple spinouts along the way. We kept it in slow and in 4WD and arrived safely about 6:30. Tired and somewhat uptight we pulled onto our road and let out a sigh of relief. As we rounded the corner we saw the Jordan’s truck at the end of their driveway. We had a welcoming committee! They both jumped out of their truck as we pulled up and rolled down the window. Brenda immediately handed up a big dish of warm chili, bread sticks and freshly baked brownies! What great neighbors we have!!!!! The temps have been a roller coaster, with highs anywhere from the mid 20’s to 40 and lows from the low teens to 30. If the winds are not too strong being outside with temps in the mid 20’s are quite comfortable. We did have one mini crisis the other day when we ran into Rapid City. It was 18 when we left, when we arrive home 7 hours later it was 28. Walking into the rig we knew something was not quite right, it was too cold. We like it cold but not that cold. We quickly determined that we had run out of propane. No biggy, we just put in a new bottle and we were good to go. Except……there was no water….not even a trickle….we were froze up! Ugh! 4:00 in the afternoon, with the temps getting down into the low teens I had to get to work. I ran to town and bought a small ceramic heater, tore everything out of the belly and took down the belly walls so I could access the water pump and assess the situation. So many hoses, which one is frozen? I was able to determine that the freeze was somewhere between the pump and the water tank but unfortunately the supply hose to the water pump heads towards the back of the rig into no mans land. You just cannot follow it without dropping the entire underbelly and for those of you who have done this know it is not something you want to do. So I put the ceramic heater in the belly (making sure nothing would catch on fire), turned up the heat in the rig (looks like I will be sleeping outside) and hoped for the best. After a hot restless night we turned on the water pump, turned on the faucet and prayed……nothing…Nerts! Time to move onto plan B…. Install foam board all around the rig and heat under the rig. Just as I was getting ready to head to town for foam board we heard the rumble of a truck coming up the driveway and in pulls in a belly dumper full of gravel. Ugh! Even though we have the house location staked out we still needed to stake out the parking area and the shed. So I ran out and told him where to dump that load and Barb and I went to work staking out the rest of what needed to be done. A hour or so later we came back in the house and just for fun I turned on the pump and the faucet….and….we had water! Whew, that is one stresser we can cross off our list. So while I stayed home and babysat the gravel project Barb went into town and pick up some foam to put around the rig. 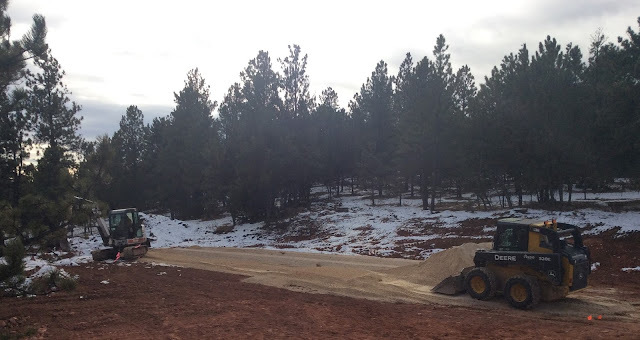 Since it was warming up a little and we thawed, the project was not as urgent as it was earlier in the day but regardless, we got it done over the next couple of days while watching the gravel project take place as well. While she was gone I dropped the underbelly pan and what did I discover? The waterline going from the main tank to the pump ran within 5 inches of the outside sheet metal before it went into the insulated floor leading to the pump. The only thing protecting it from the elements was a thin piece of sheet metal. Talk about a bad design! I also saw a kink in the vent hose so I fixed that at the same time. So I set about protecting it with 2" foam and covered it with two bottles of spray foam. Only time will tell but I am thinking that should do the deal. We had enough gravel delivered to prep and level our building site as well as finish off the RV and shed area. Now we should be ready for concrete in the spring if we are ready for that phase of the project. In our spare time we have been continuing our fence work putting in the remaining T posts and put up a couple more strands of wire. Barb also transplanted a few trees hoping to get a line of trees growing to the north. Meanwhile over at the Jordan's Jim and Brenda have been busy with their own project of running sewer pipe down to their drain field. Sound like a lot of work? Well, we have managed to get out twice with Jim and Brenda as well as Phil and Rudee. Once to dinner and once to watch the Thursday night football game at a bar in Custer. With all this going on we feel like we have been back here for weeks but in reality it has been less than 10 days. It has to slow down sooner or later! Well, the bottom fell out of the weather here in North Dakota. What was crisp cool mornings with mild afternoons turned frigid mornings and downright cold afternoons. This past week, we have not seen highs over the 30’s and the lows have been in the teens. So why have we not left the North Dakota frozen tundra and headed to warmer climates? Well, three reasons really, 1)This is the best time to deer hunt in this area, 2) my brother Bob has come to visit but the third and probably the driving reason is that Barb is still not back from her hiatus in Pennsylvania and I have no vehicle to move this beast! Brother Bob came up to do a little duck hunting, visit and get a little taste of “farm life”. Unfortunately the weather really put a damper on the duck hunting. Within a matter of hours overnight all but the largest bodies of water froze solid and the ducks, apparently being smarter than us, moved south. We did get out once breaking ice, setting decoys and waited for the birds. As dawn broke ducks would fly over, look down and see some of their brethren frozen in what looked like a solid block of ice while others saw an opportunity find some open water. Although we had a good hunt the funniest part was watching the ducks landing on what they thought was open water. The landings were gentle but then they would skid and slide across the ice looking somewhat confused when they came to a stop. They also put brother Bob to work burning a few bales of cattails from sloughs that had gone dry due to the drought this summer. He left the day before Barb was to arrive home from her trip in Pennsylvania. She sent me a few pictures to show me how much fun they were having! Dylan and Kendall ready for Trick or Treating! I in the meantime went to work cleaning the rig. Over the past two weeks it became painfully apparent that Barb is the glue that holds everything together around here. I had done laundry several times while she was gone so now I needed to transfer all my clothes from my temporary closet/dresser (aka, her side of the bed) to the real closet and dresser. It had been a few days since I did laundry so I was not sure what was clean, what was dirty, it was all kinda intermixed so I have to resort to……..the smell test. This is an effective but not recommended way to determine what is clean and what is dirty. In the future I need to remember to maintain separate piles. On the farm side it has been a busy couple of weeks! I attended the Ward County Farmers Union annual meeting with Bob, Deanne and Holly. (Bob is the president) I went mainly for the free meal but was pleasantly surprised when my name was drawn for one of the door prizes. A $25 gift certificate to Cenex! When I raised my hand with the winning ticket I know everyone in the room was wondering “Who is this guy?”. Bob reading off my winning ticket number! I also attended the annual steak fry at the Max Civic Club. This is the third year in a row that we have attended this event and everyone knows everyone. (Except for me and my brother Bob) When you walk in you have to write down your name and how you would like your steak then they bring it to you when it is done. Every year we have to write "with the Finkens" on our piece of paper otherwise we would never get our food! I also got to drive one of the tractors from Minot back to the farm. A rocker arm had blown out a couple of weeks ago (I won’t tell you who was driving it at the time) and it had to be trucked in for repairs. The dealer charges over $500 to truck it back to the farm so instead I drove it the two hours (at 20mph) from Minot to the farm. Kinda weird as you have to go right through the heart of Minot and the rest of the way is on the key artery into town. But I figured I was bigger than everyone else and they would move out of the way. Speaking of farm life, one of the main crops here is Canola. An interesting little plant. Growing up I had never really heard of Canola and for good reason. It did not exist until 1978 when it was invented to describe an oilseed that was selectively bred from rapeseed. With seeds about the size of poppy seeds, there are several uses for Canola but the most well know is cooking oil. The seeds are crushed and the oil is extracted and ultimately it makes it way into the cooking oil bottles. Imagine how many seeds it takes to fill one bottle and multiple that times the world wide demand. That is a lot of those little seeds being crushed! One of the things that makes this crop so appealing to farmers in this area is the fact that there is a processing plant in nearby Velva North Dakota. So while other farmers may drive several hours to get to this facility, the Finken's have a relatively short drive. Along with the cold came….. you guessed it snow. Less than an inch but snow nonetheless. We were hoping to avoid the white stuff and be long gone before it arrived. I did some final harrowing on the day it snowed as that was probably the last day they will be able to work the fields until the spring thaw. The snow geese also arrived. In the tens of thousands. This picture does not do it justice but almost every field was covered with geese. Despite the cold, the wind and the snow I went out deer hunting each of the last 6 days but unfortunately no shooter bucks presented themselves so we are going home venison-less. 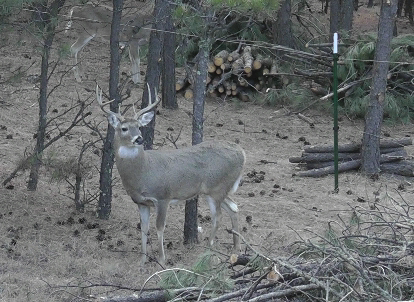 Luckily we received a call from the butcher in Rapid City that our South Dakota deer is ready for pickup! Brrrrr... it was chilly out in the deer stand! But alas, all good things must come to an end. Barb arrived home safely after a 16 hour travel day and was greeted by getting hugged, mauled and licks to the face (you’ll guess who did what). She looked around the rig and said “Oh my”….. I knew my cleaning was not up to her standards but you have to give a guy credit for trying!